This book’s title I’m Happy for You (Sort Of…Not Really) grabbed me almost instantly. As the subtitle explained the book’s theme as “Finding Contentment in a Culture of Comparison,” I decided that Kay Wills Wyma might be able to offer some insight into a personal struggle I have. I don’t think I realized how bad it was until I found myself identifying with what she wrote on nearly every page. I have what Kay Wills Wyma calls Obsessive Comparison Disorder. Whether it’s a Facebook or Twitter post or a conversation with a friend I run into in the grocery store aisle, I seem compelled to compare my own performance or that of my children to someone else’s. I love Wyma’s reminder of how this should look in regards to our children. Just a couple of days ago, I found myself thinking, “Oh, their family did that and we didn’t. Are my kids missing out? Should I have done more?” Then I caught myself and realized that comparison was sliding in, no matter how much I’ve been trying to keep it out. She so perfectly puts what I want the attitude to be for the children in our home. 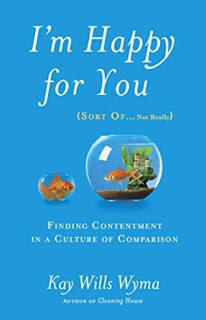 Yes, if you struggle with comparison and discontentment at times, like I do, read this book. I’m on my second reading, marking more passages so that I can review them in the days to come. May I learn to live in gratitude for how God has made me and our children, seek to reach our own potential, and genuinely celebrate with others in their accomplishments. I was not compensated for this review in any other way. This book sounds like a great read! I read another one of hers a few years ago about having children do more around the house, and it was excellent! I should probably read it again. Thank you for your kind words! So glad God is continually teaching us and refining us into His image! I love this!!! It's so true. Looks like one I need to read. I try to be very careful about not comparing but it creeps in so easily.